Several members have recently asked me to give some general help or advice about growing Sweet Peas for our Annual Show. So here goes but please note that these are my own notes, other members may have a completely different system and still produce excellent results. First choose the varieties that you wish to grow. I strongly recommend that you buy show quality seed from a specialist seed grower. Contact me for further details. Sow your seed by late October or early November. In 2012 I sowed my seed on 2nd November for the 2013 season. This was later than normal but proved to be perfectly satisfactory. I use a good quality multi-purpose compost (Levington) mixed with a few handfuls of Perlite or Vermiculite for extra drainage. However some seed companies do recommend sowing in John Innes soil based compost. 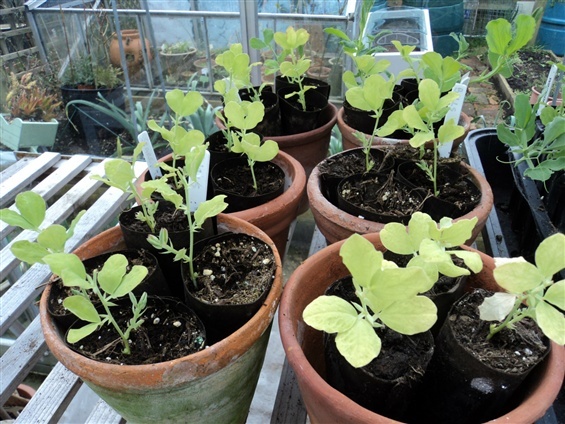 I now always sow into Root Trainers (Haxnicks) alternatively use special sweet pea tubes as a second choice both available from local garden centres. Don’t bother to pre-soak or chip seed, place one seed in each cell and label accordingly. Most seed packets will contain approximately 10 seeds. Water the seeds well and place in a cold greenhouse or cold frame. Germination should take 10-14 days. Finally set a few traps as mice love sweet pea seeds. 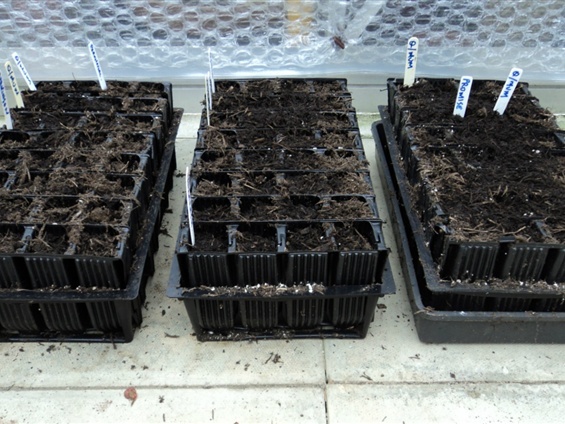 When the seedlings are about two inches high keep them outside in a cold frame or sheltered spot for the winter still taking precautions against mice and slugs. Don’t leave them in the greenhouse as they will get too leggy! Pinch out the growing tips when they have three pairs of leaves. This will make them develop at least two side shoots. It is these new shoots that will carry the large exhibition blooms. By March they should be about 6-8 inches high and ready to transplant out to their main site. Prepare the ground thoroughly with plenty of manure or compost. 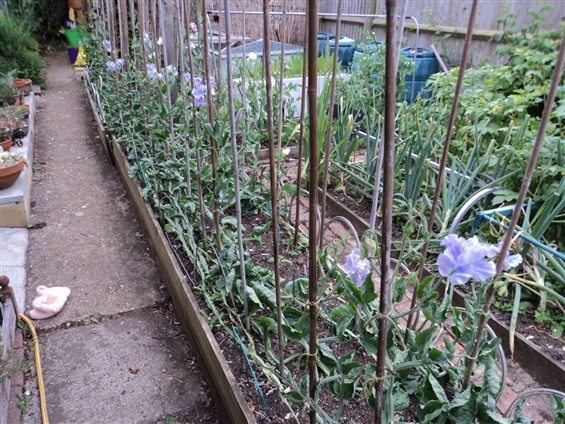 Sweet Peas are gross feeders and enjoy plenty of goodness in the soil. I also apply some “blood, fish & bone” granules just before planting. 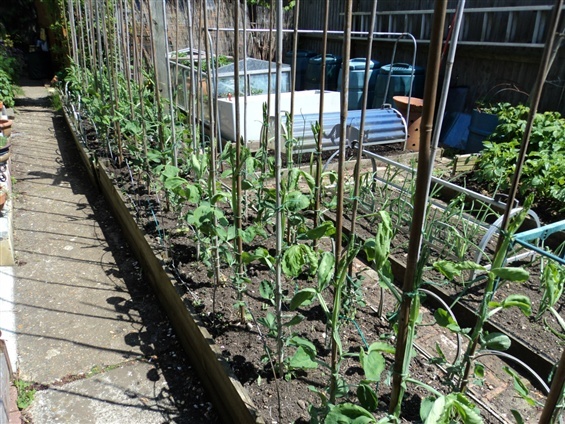 Erect several rows of 7ft canes to support the plants similar to those used to support runner beans. Transplant one sweet pea plant to each cane and tie in. Save any spare plants to replace those that are lost over the next few weeks. Continue to mark with the plant labels so you know the variety. If the weather turns cold try to give them some protection. I use garden fleece wrapped around the bamboo canes. As soon as the weather warms up they will shoot away quite quickly. Tie then to the canes every few days with soft string or use the special sweet pea rings available at all garden centres. Reduce the two stems to just one if you want the best chance of top class blooms for the show. Every few days pinch out any side shoots or tendrils growing from the leaf joints. Tie the plants to the canes every 6 – 8 inches. This extra support is said to make them grow faster and they won’t snap of in any strong winds. When about three feet or more in height the plants may tend to produce young flower stalks. You do not want to let the plant flower at this stage so remove all flower stalks until about two weeks before the show. When the plants near the top of the canes you may need to layer them if you want to prolong the flowering period. I had to do this on 17th July in 2013 but a month earlier the year before. Layering often confuses growers but it’s not difficult. Carefully cut all the ties supporting the plant remove any flowering stems then lay the plant along the ground to a suitable cane further down the row, tie the top twelve inches of the plant up a suitable vacant cane so it can grow away again up to the top. Remove all flowers until the plant has grown again to waist height. You want the plant to increase its height not produce flowers at this stage. When about three feet in height start picking blooms regularly. Never leave blooms on the plant or it will quickly go to seed and the whole growing plant will shut down. When you start picking bunches of peas use them to practice staging in a vase with a piece of oasis. Cut show blooms the night before the show and soak in a vase overnight. Take your blooms to the show hall early Saturday morning ready for staging. 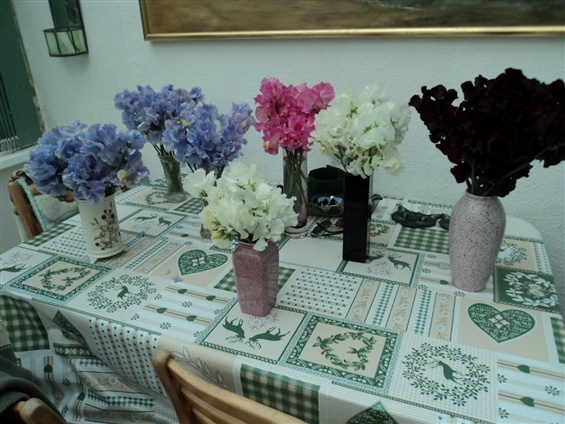 Show vases will be supplied by the Society for your use. If you need help or advice then please asks, there’s always someone about to help you. Good luck and see you at the show. With a little bit of care and good luck you may soon be picking up a winner’s red card and prizes!